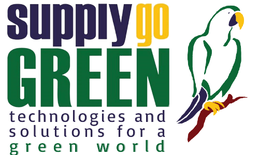 Advertising on SUPPLYgoGREEN technologies for a green world, our environmental marketplace platform, is a unique opportunity to reach a huge global audience in a professional and targeting way. Your brand will be presented in a marketplace platform for environmental technologies and solutions in Europe and worldwide for an affordable price. and your visibility on the web. You can be easy identified from a target audience and reach more traffic. It is one of the best ways to build your brand online. - your ad will have an individual URL, easy to share in the social media. We partner up with our advertisers! IF YOU WOULD LIKE TO ADVERTISE SEVERAL PRODUCTS IN DIFFERENT CATEGORIES, WE CAN GIVE YOU A SPECIAL PRICE PACKAGE.